The Liebers: It's Nice to be Appreciated, but can we Schedule it when I'm not so busy?! It's Nice to be Appreciated, but can we Schedule it when I'm not so busy?! 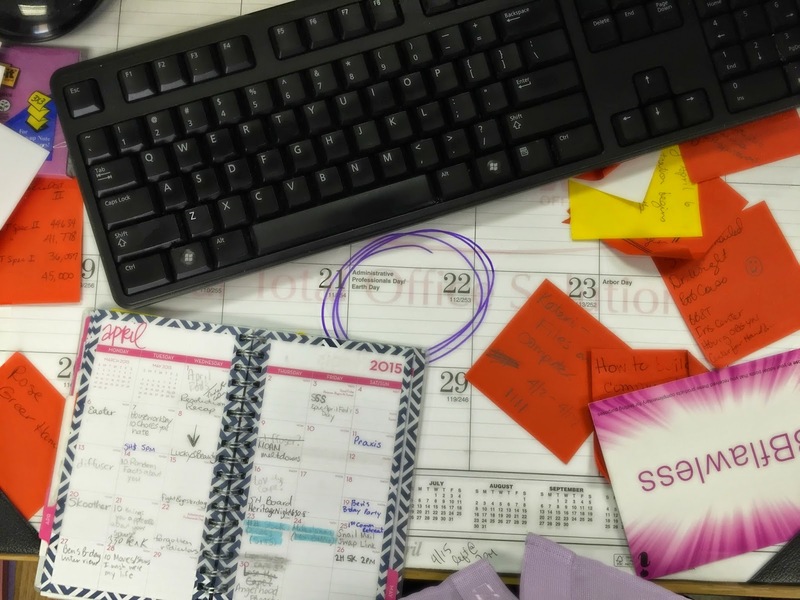 If I move around a couple of things on my desk so I can get to my calendar, I can see that today is Administrative Professionals' Day. Woohoo! That's me!! I have a program to go to this morning and I'm getting a certificate for completing a series of training workshops. It's only taken me about two and a half years to finish it! And technically I still have one class left, but they're letting me "graduate" anyway as long as I promise to finish that class this summer. Looking at the calendar on my computer, I can barely see the graduation program through all the other things scheduled. I work in academia, so this is the big push to finish up the semester. It's also when we start the count down to the end of the budget year. Our office is hiring seven students for next year and that entails 12 interviews. I also have two trainings this week and next week to go to. I'm sure there are other things I'm forgetting. My planner is pretty ridiculous at this point. There's also lots going on at home. While the hours don't overlap, the space in my brain does and it's getting harder to keep track of all the things that need to happen. There's a workshop called Healthy Brains/ Healthy Child going on tonight at my daughter's school. I was really looking forward to it. Especially because dinner and childcare are provided. That's my love language, right there!! Just this morning, however, I realized that it's not likely to work out. Henry meets with his big sister today and doesn't get home til 5:30. Frances has a program with her after-school group that goes until 6. Ken could keep the kids and let me go by myself, but we've only got one vehicle right now and he wouldn't have a way to pick them up. It's nice to be appreciated, but I'm wondering if this couldn't be scheduled at a better time of year? 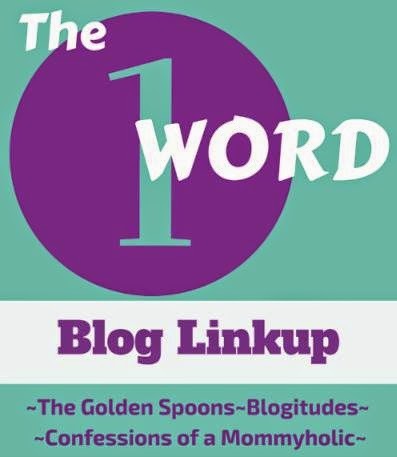 I'm linking up with the 1 Word Blog challenge. This week's words are forgotten and ridiculous. I hope tonight goes smoothly and I know it is crazy here right now. So, I feel you pain on this totally though! Eeks! Well, congratulations first of all Rabia, what an accomplishment! But yes, I can totally relate to being busy and I don't like it one bit. That's when I have to seriously pull back because I can't stand packed schedules. When it rains it pours - good and bad. Hopefully you'll be able to work out something for the evening. I'm being as optimistic as I can for you ;-) Congrats on that award! Ack what terrible timing! Dinner and childcare taken care of is awesome! Sounds like you need a few more hours added to your day. And another car! Oh, I hope you got everything worked out so you could enjoy your special day!!! Oh, I so get that! I was just looking at our spring schedule and decided it was INSANE! Hope things can calm down for you soon! Oh, I hear you!!! This week is nuts for me, too. I had to work on Monday (which I usually don't) due to a meeting. I had to work until 5:00 on both Tuesday & Wednesday (I usually leave at 2:00) due to a "planning retreat" my department had. Megan has soccer games Tuesday & Friday. The elementary school has the Book Fair this week and needed volunteers AND Emily is in the school talent show on Friday night (at the same time as Megan's soccer game BTW) which means she also has dress rehearsal today (Thursday) and they need volunteers for all that as well. Oh, and David has been out of town for work all week. Why does it seem that, sometimes, everything happens all at the same time!?!?!?! Spring is insane, isn't it? i thought it would be much more mellow. I could use that appreciation day much later in the year. This is certainly a full load and I wish you lots of balance soon! It's finally slowing down here!! I actually had a moment to breathe and laugh about funny internet stuff! Seriously! All the end of the year stuff doesn't have to come at the end of the year, does it?? OK, well maybe it does, but it's still annoying! We're almost there! Thankfully my college-based schedule is slightly different from the public school based schedules. I slow down a bit just as the kids' stuff really ramps up. Oh Christmas!! That's crazy time too, for sure! I did enjoy it, Kim. It was stressful to think about the time away from the office, but the training was well worth it and I'm glad I went! I could use an empty weekend! This one coming up isn't as busy as some others recently, so we'll get a bit of a break. I did manage to get there, so I'm glad it all worked out. The message there wasn't exactly what I'd thought it was going to be, but still useful info. Thanks Kenya! It all managed to work out just fine. It was a busy, busy day, but I got in all I wanted to. Thanks, Nina! Things are slowing down a bit for now, so I'm trying to take a few breaths and relax. Yes, things are already starting to calm down. Exams are next week and then things will get really quiet at work for a little while. I've got some things to take care of, but no pressing deadlines. Things worked out really well, Janine! Thanks!